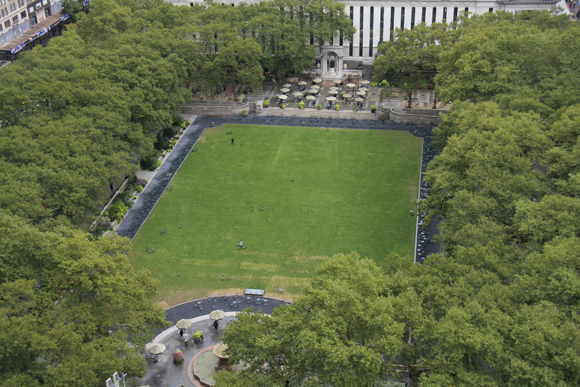 If you've ever arrived at the park to find the lawn closed, or been asked to remove the plastic sheet beneath your picnic blanket at the HBO Bryant Park Summer Film Festival, you might have been a bit annoyed with our staff. But we're not the fun-killers you imagine. We are careful managers of the maintenance to the lawn, testing water levels daily, preventing harmful uses of the lawn, and when necessary, replacing patches of sod to keep the lawn green, healthy and open to the public all season long. Despite all of our efforts, the lawn takes some wear and tear each year. 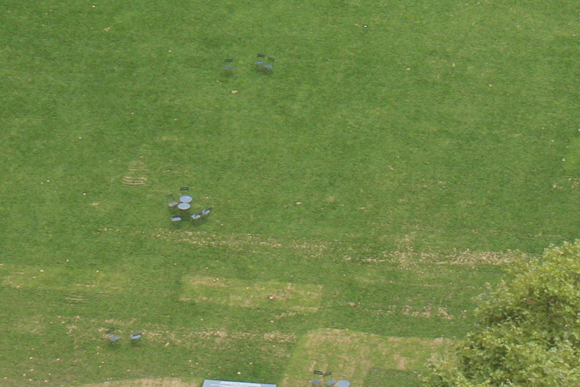 As the final day of the lawn draws near on October 10, we can take a look back at the season's activities by examining the scars left on the lawn. 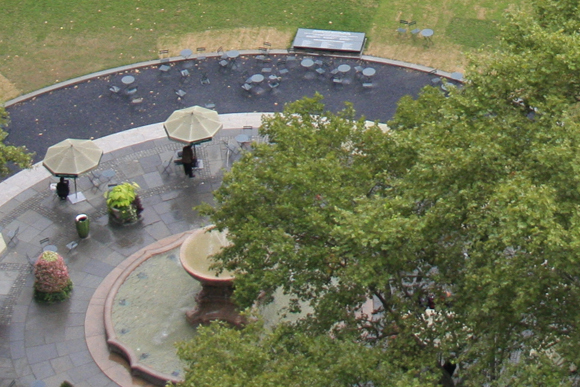 The west side of the lawn is one of the major access points from the busy Fountain Terrace and 6th Avenue entrance. Due to heavier use, the edges of the lawn are worn, and the light patches of grass show areas that were re-sod unsuccessfully. In July, the lawn served as the venue for the Madden NFL Pigskin Pro-Am, and was painted like a football field with yard lines, end zones and logos. Most of the paint grew with the grass, and we were able to mow it right off, but some of the paint wouldn't budge. Though we try to re-sod sparingly, it can be an effective way to keep the lawn uniformly green. In this case, it revived the worst sections of the lawn. Below you see uneven patches, where the new sod mixed with existing sections. Over-use from walking and standing can also cause significant problems for the lawn. When our free juggling classes began to draw more people this season, we asked them to use different sections of the lawn each week, to avoid trampling in one area. You can still see the effects of repeated use left behind by Bryant Park Fall Festival presented by Bank of America. 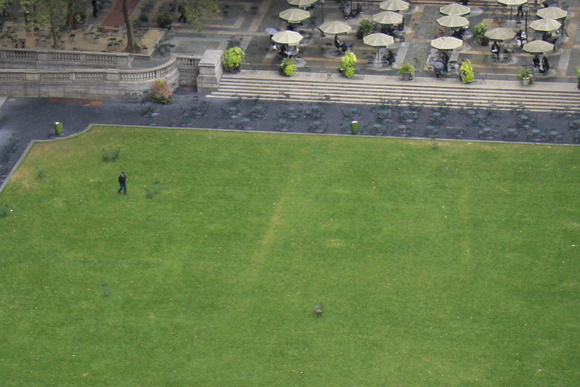 The lines on the eastern side of the lawn show where aisles were created between the audience seating. The festival's eight days of performances invited thousands of visitors up and down these lines to access seating, as well as performers, photographers, and ushers pacing among the crowd to pass out programs. Though you see the scars on the lawn today, October 5th is also the 110th lawn open day for the 2011 season. Not too bad... marks and all.